The online retailer is offering huge discounts across various categories and we have the best ones already here for you. The much-teased Flipkart Big Shopping Days sale has commenced and will go on till May 16. 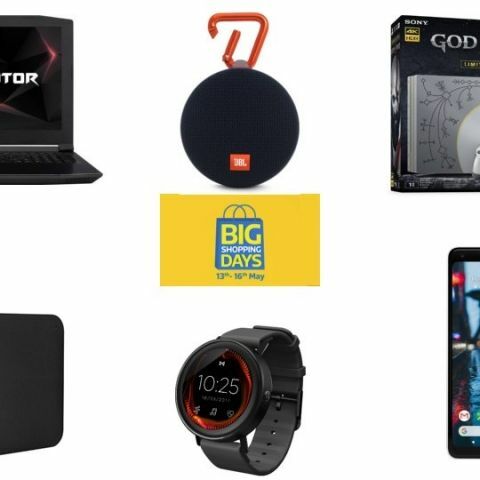 The online retailer has promised of offering “Crazy deals” where gadgets will be offered at their lowest prices and we have rounded up some of the best offers from the sale. Smartphones, electronics like laptops, cameras, audio devices, laptops for regular use and gaming, gaming consoles, accessories and more are up for sale at considerable discounts. HDFC bank debit and credit card customers can avail ten percent instant discount on eligible products as well. Without any further ado, let’s take a look at the deals. Flipkart is offering the latest Google smartphones, the Pixel 2 and the Pixel 2 Xl, with a considerable discount, of up to Rs 10,000. The smaller Pixel 2 sports a 5-inch screen with a 16:9 display aspect ratio, whereas the Pixel 2 XL comes with a larger 6-inch display with an 18:9 display. You can buy the Pixel 2 here and the Pixel 2 XL here. The last year flagship Samsung Galaxy S8 series smartphones have received a Rs 12,000 and Rs 10,000 discount respectively. Both the devices are powered by the quad-core Exynos 8895 processor but the Galaxy S8 features a 5.8-inch Super AMOLED Quad HD+ display, whereas the Galaxy S8 Plus comes with a 6.2-inch super AMOLED display. You can purchase the Galaxy S8 here and the Galaxy S8 Plus here. The Apple iPad Pro has received a massive Rs 10,000 discount. It features a 10.5-inch retina display and is powered by the A10X Fusion Chip with 64GB internal storage. The device is equipped with a 12MP rear camera and comes with a 7MP front-facing sensor. You can buy it here. The Redmi Note 5 is powered by the Snapdragon 625 Processor and comes with 4GB RAM and 64GB internal storage. The device features a 5.99-inch Full HD 18:9 display and comes with a 12MP rear and a 5MP front-facing sensor. You can buy the Redmi Note 5 here. The 3GB RAM/32GB storage variant of the Honor 9 Lite is up for sale at a slashed price of Rs 8,999. Its 4GB RAM model can also be purchased for Rs 14,999. The Honor 9 Lite is powered by the Kirin 659 Processor with 3GB RAM and 32GB internal storage. It features a 5.65-inch full HD+ display and is equipped with a 13MP + 2MP dual and front rear cameras. You can buy 3GB RAM variant here and the 4GB model here. The Galaxy On Max is powered by the MediaTek MTK6757 SoC and 4GB RAM coupled with 32GB ROM. It features a 5.7-inch Full HD display and is equipped with a 13MP sensor on the front and rear cameras and is backed by a 3000mAh battery. You can buy it here. The 43-inch variant of the new Smart TV 4A series is capable of handling full HD video playback, whereas the 32-inch model can play HD ready (720p) videos. The new Mi LED Smart TV 4A series come with 1GB RAM and is powered by a 64 bit quad-core Amlogic processor with 8GB of onboard storage. They feature 20 Watts stereo speakers (10W x 2) and support DTS sound. You can purchase the TV here. The TCL LED Smart TV features a 40-inch Full HD display with a 1920 x 1080p resolution and comes with a 16W speaker. The device features three HDMI ports and two USB ports and has a 60Hz refresh rate. Check out the TV here. The Mi LED Smart TV 4 is powered by an 64 bit Amlogic Quad-core CPU with Mali T830 GPU . It features a 55-inch 4K HDR display with a 10-bit panel and 60Hz refresh rate. It comes with 16W speaker and connectivity options include dual band Bluetooth 4.0, Wi Fi, 3-HDMI ports (1 ARC), 1-USB 3.0 port and 1-USB 2.0 port. You can purchase it here. The 43-inch Thomson LED Smart TV supports 4K UHD video playback with 60Hz refresh rate. The TV comes with three HDMI and two USB ports and is equipped with a 20W speaker for audio. It is powered by an ARM Cortex CA53 64-bit processor with Mali-T720 GPU. You can buy the television here. The Acer Predator gaming laptop is a device meant for those who take their gaming seriously, even while travelling. The laptop is powered by an 8th Gen Intel Core i7 processor, coupled with 8GB DDR4 RAM and a 4GB Nvidia Geforce GTX 1050 Ti. The device features a 1TB HDD and a 128GB SSD as well. You can buy it here. The Acer laptop comes with the latest 8th Gen Core i5 Processor with 8GB DDR4 RAM and 1TB HDD. It features a 15.6-inch HD display and comes with the Nvidia GeForce MX150 GPU You can buy it here. The Acer Aspire 3 A315-51 Laptop is powered by the 7th Gen Core i3 processor and comes with 4GB RAM with 500GB storage. It features a 15.6-inch display and comes with integrated Intel HD 620 graphics. You can purchase the laptop here. The GoPro Hero action camera sports a 10MP camera and supports WiFi and Bluetooth connectivity as well. The waterproof, rugged camera features voice control, stabilization, touchscreen and more. You can buy the camera here. The camera is equipped with a 20.9 MP CMOS sensor and comes with a 3-inch LCD. It has a max shutter speed of 1/60 and sports digital zoom of up to 14x. The device comes with Carl Zeiss Vario-Sonnar Lens with 10.4 - 37.1 mm focal length and an aperture range between F1.8 (W) - F4.9 (T). You can check out the camera here. The Google Chromecast 2 can easily cast your smartphone to the TV and it can be connected via an HDMI port. It has received a 20 percent discount and can be purchased here. The JBL Clip 2 is IPX7 waterproof and sports a 3W audio wattage. It boasts a battery life of 8 hours and comes with 40 ohms impedance. You can buy the device here. The Google Home mini is a smart speaker which comes with the company’s smart assistant. It can help user in performing tasks via voice commands like setting reminders, playing music, reading the news, controlling smart home lights and more. You can buy it here. The JBL soundbar has a rated power output of 150W and features a 9.5-inch wireless subwoofer with volume rockers. The device can be connected via Bluetooth and comes with Dolby Digital support. You can purchase the device here. The Soundmagic E10C Headphone sports an in-ear design and comes with integrated buttons for calls and music controls. The device comes with 16 ohm impedance and a frequency response between 15-22000 Hz. You can check it out here. The speaker features a built-in battery and sports a power output (RMS) of 3W. It comes with 4 Ohm impedance and features frequency response between 20-20000 Hz. The device can be connected via Bluetooth You can buy it here. The 10000mAh Syska power bank features a 5V/2.1A power output, which essentially means it can quick charge devices. There are two USB ports on the device and you can buy it here. The Mi 20000 mAh power bank also comes with two output ports of 5.1 V/2.4 A and another one with 9 V/2 A, 12 V/1.5 A. You can purchase the device here. The Misfit Vapor is an Android Wear 2.0 device, which is powered by the Qualcomm Snapdragon 2100 SoC. It features a 1.39-inch AMOLED display and can track heart-rate and is water resistant up to 50m. Purchase the device here. The SanDisk Ultra flash drive features high-speed USB 3.0 interface and promises of delivering up to 100Mbps data transfer speeds. It is also compatible with USB 2.0. You can purchase the device here. The 32GB Samsung EVO Plus MicroSD card is Water-proof, X-ray Proof, Shock-proof, Magnet-proof and is also a class 10 memory card which claims of up to 20Mbps write speeds and 95Mbps read speeds. You can buy the device here. The 1TB Toshiba Canvio Basics external HDD boasts of a 5.0Gbps data transfer speeds and connects via a USB 3.0 cable. The 2.5-inch external HDD can be checked out here. The gaming console comes pre-bundled with Assassin's Creed Origins and Rainbow Six Siege gaming titles. It has received a huge discount and can now be purchased at Rs 22,990. You can buy it here. The 1TB Sony PS4 Pro console comes with more powerful internals than its predecessor with the 2.1GHz 8-core AMD Jaguar CPU, coupled with a 4.2 TFLOP AMD Radeon GPU. It comes with 8GB GDDR5 + 1GB RAM. It features 3x USB 3.1, 1x Gigabit Ethernet, 1x PS Camera, Optical Audio output, and an HDMI 2.0 port. Check it out here. The recently launched Xbox One X is on sale with a 10 percent discount and can be purchased priced at Rs 43,470, along with a Rs 5,000 cashback. The console supports gaming at 4K resolution and also doubles as a Blu-ray player. You can purchase the device here. Can we buy laptops from any shopping website ?